I’ve been a fan of Super Dungeon Explore for a while now. I very much like Dungeon Crawl games, and the cutesy feel of the miniatures in no way detracts from the experience, rather it separates it from other dungeon crawling games such as Descent: Journeys in the Dark. However, one pretty major flaw as far as I was concerned, was that the game was standalone adventure. And by that I mean you play a game, which can be ludicrously hard (I’ve seen more villain wins than hero), and at the end of it your character escapes the dungeon with their loot…and that’s it. Next time, start again from scratch. There was no campaign setting, which is a problem. One rectified by a Kickstarter back in 2015, for the add on Super Dungeon Legends. here is the most recent update. We hope you’ve all had an excellent week and are ready for some Super Dungeon action. First up, we want to revisit Starfire. We spent the week chatting with the production team, and have come up with something that I think you’re all going to like. The new pose Starfire will be included in the Super Dungeon Explore retail box. Slither along, singin’ a song. Apparently we seriously underestimated the love of the original Starfire sculpt. Because of this, we will be offering him as the new King Starfire model. Backers who pledged for New Player, Explorer, Legendary, and Completionist pledges will receive BOTH models for FREE! One day I will be King, and you will all burn. That’s right, twice the Starfire, twice the fiery Hero destruction. 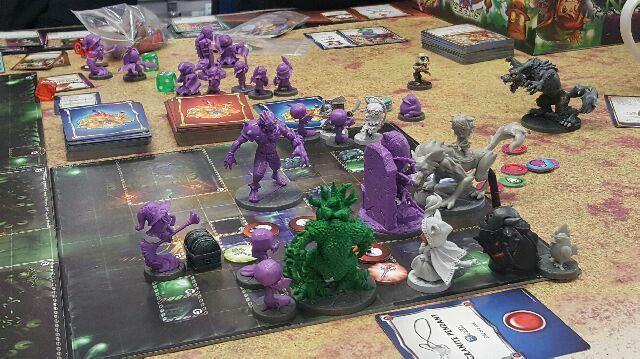 As Super Dungeon: 2nd Edition has continued development, we’ve had an large influx of backers asking if they can add 2nd Edition to their pledges. Because of this, and because we now have two Starfires coming out with 2nd Edition, we are reopening the pledge manager for a limited time until February 27th, which is our cutoff date before the manufacturing of Wave 1 begins. If you would like to adjust your pledge please contact info@sodapopminiatures.com and we’ll be happy to help you through the process of adjusting your order. If you do plan to use this period to adjust your pledge, there are a couple things to be aware of. First, if you are adding 2nd Edition to your pledge it is a heavy boxed game and will affect your shipping charges. Second, our shipping charts were a couple years out of date and the constant rise of shipping costs necessitated that we finally update our charts accordingly. We continue to only charge the actual cost to ship. When you order a Kickstarter item you can choose the Kickstarter Shipping (formerly Ninja Ship) option for your payment which is cheaper than standard shipping, but it is now more expensive than when we originally closed the pledge manager in November which was using the older rates. Please, please, keep that in mind. This week we take a look at one set of the alternate drake profiles included with 2nd Edition Classic Mode. Note: These cards are still undergoing final layout and editing. The drakes of the Frostbyte Reach plague the frozen caverns, ruins, and forests of that frigid land. Utterly in the thrall of the Sapphire Dragon, Hoarfang, the drakes share his mercurial behavior. Many dwarven holds have even “tamed” clutches of drakes to serve as companions and hunting beasts. However, they must always be on guard for it is not uncommon for a clutch of drakes to suddenly turn upon their allies should the mood strike them. The Cold Eggs spawning point is an alternate profile for your Egg Clutch spawning point models. Its profile remains largely the same. However, it now has the Black Ice ability which pushes models which end their activation close to the Cold Eggs two squares away. Hatchlings have a difficult time surviving in the barren landscape of the Frostbyte Reach. Most eek out a meager existence feeding upon the frozen remains of those felled by the more vicious monsters that stalk the reach. The frozen Frostbyte Hatchlings are easy to underestimate. With two actions and two hearts they can be surprisingly durable and hitty for a one skull point monster. The Shatter ability allows them to add +1B STR when attacking a target suffering the status effect Ice. Something you’ll recall the Frozen Warren Kobolds have in good supply. Whelps hunt in roving packs, savaging the wilderness of anything remotely edible. Remarkably intelligent, many whelps hover around the outskirts of dwarven and freyjan civilizations, feeding off scraps, and occasionally allowing themselves to become partially domesticated in return for regular feedings. Whelps are strong base-line minion monsters. Their STR 2B1R is really stout, and able to hurt many Heroes. Like the Hatchlings they have the Shatter ability, increasing their STR against Heroes suffering Ice. They also cause the status effect Ice which is one of the meaner status effects in the game, preventing Heroes from using their unique actions. Wyrmlings swoop and soar upon the bitterly cold winds that sweep through the Frostbyte Reach. Their chirruping cries carry on the wind and are regarded by the orc tribes as signs of good favor and battles soon to come. In many ways the Wyrmling is a fusion between the Hatchlings and the Whelps. Two actions and two hearts, along with a strong base STR and ARM, make it durable and fighty, Like the others, its offensive potential is increased by the ability Shatter. The ability Fly allows it to move pretty much wherever it likes in the dungeon. The Wyrmling has two unique offensive actions. Frozen Detonation is a burst area effect, hitting the target and every adjacent model, while inflicting the status effect Ice. Ice Lance hits three models in a straight line also freezing them. Not surprisingly, the Cold Eggs spawning point is a perfect companion to the Frozen Warrens. When used in conjunction, the two spawning points keep the Heroes frozen and unable to use their unique actions, severely limiting their options. mmmm herosicles! Before we leave I would just like re-highlight our customer service address. If you ever have questions, concerns, comments, or dance moves to share we are always happy to hear from you! First thing of importance, a free King Starfire added to Most of the pledge levels. For anyone not on the Dark Consul Pledge, an extra Mini of high quality appears to be getting added gratis. However, there have been some grumbles (which are legitimate I think) that the Dark Consul pledge doesn’t get it. The Dark Consul pledge was intended to be for the Veteran Gamer, who doesn’t want to buy the Second edition of Super Dungeon Explore (Part of the Kickstarter was a rerelease of the original game, but updated. Dark Consul was intended for people who already had the core game and didn’t feel it necessary to splash out another $50). The gripe is that a new reward is being added after the fact, as a freebie, and those not getting 2nd Edition wont receive King Starfire. Technically, the miniature is simply an addition to 2nd Edition, but it is being thrown in free and I can see why Dark Consul backers would feel left out. Second important thing. We have a date for wave 1 manufacturing. End of February for the first wave of Kickstarter stuff to go into manufacturing. This is good(ish) news. The Kickstarter is already running very late (originally billed as Dec 2016), however, under the circumstances it can be forgiven. A lot of stuff was added free through completed stretch goals. And the pledge manager is open for anyone who wants to get in on the Kickstarter, until Feb 27th. Add to that, more types of Kobolds and you are getting a pretty solid gaming experience. Back when I had money, I backed this as a completionist and as such, am getting everything. Sparkleburst – probably the sound of their spleen exploding or something.